Learn how to sync deadlines for your projects and tasks with your calendar app. You can sync your due dates for all your projects and tasks with Gmail, Outlook, Apple Mail and many other email programs that supports the iCal format. 2. Click on the menu button next to the 'Add Task' Button and select 'Add to Calendar'. 3. Copy the subscription link. 4. Go to your Calendar app and add a new subscription using our link. Once you've successfully added the TrackingTime calendar, all due dates for your projects and tasks will be displayed in your calendar. 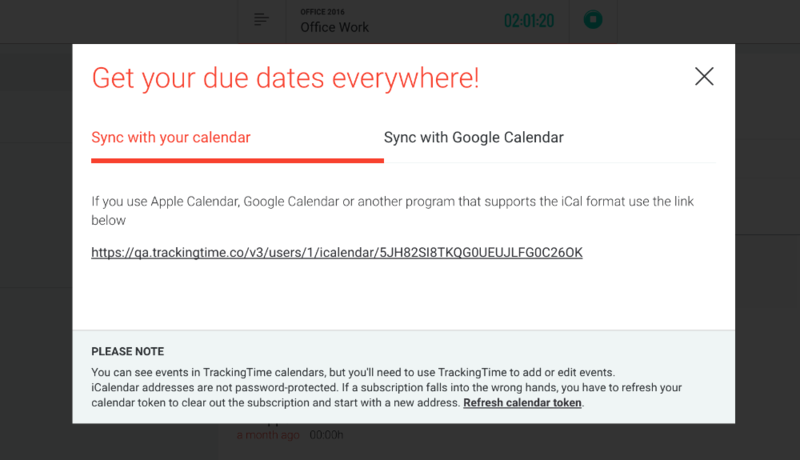 When you edit due dates in TrackingTime the changes will be automatically synced with your calendar. However, you cannot update due dates in your calendar app, but only view them.